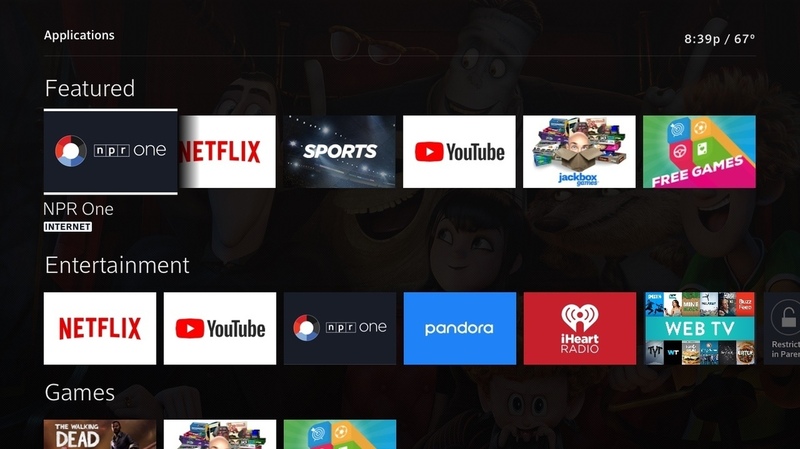 NPR And Comcast To Launch NPR One App On Xfinity X1 X1 customers will soon be able to access NPR One's award-winning programming on their TV by saying "NPR" into an X1 Voice Remote. March 7, 2018; Philadelphia, PA and Washington, D.C. - Comcast and NPR today announced the launch of the NPR One app on Xfinity X1, enabling X1 customers to access NPR's growing library of news, talk and music programs with a unique lean-back experience that can be personalized to their specific tastes, locale and routines – directly on the TV. Rolling out to capable X1 set-top boxes in the coming weeks, all programming will be accessible over the internet by just saying "NPR" into the X1 Voice Remote. NPR content also will be integrated into Xfinity on Demand menus, appearing alongside related content including news, music and more. "We continue to focus on putting people's favorite content and experiences on a single platform, Xfinity X1," said Nancy Spears, Vice President of Strategy and Execution, Comcast Cable. "NPR has created a very personal listening experience with the NPR One app and we look forward to giving longstanding and new fans the ability to access the public radio programming they want directly on the TV, with just the sound of their voice." "Every day, people are finding new ways to listen to public radio," said Joel Sucherman, Senior Director of Digital Products at NPR. "NPR One feels right at home on X1, bringing the best local and national news, along with your favorite podcasts, in a personalized experience that gets smarter the more you listen." Saying "NPR" or "NPR One" into the voice remote to launch the app, or accessing it directly via the apps menu on X1. Forthcoming features will include the ability to call up a specific NPR program or podcast by name or topic by saying, for example, "Show me Ask Me Another on NPR One;" "Planet Money on NPR One;" "Show me Up First on NPR One;" or "Show me NPR Politics." Following the initial roll out, finding relevant NPR programming alongside related news, music and more within Xfinity On Demand. Signing in and building a personalized and localized experience just by listening to and interacting with the programming. Customers can also access content from their local NPR Member Station via the NPR One app on X1. NPR One will join other popular internet apps including Netflix, YouTube, Pandora and iHeartRadio on the X1 platform. NPR's rigorous reporting and unsurpassed storytelling connect with millions of Americans everyday—on the air, online, and in person. NPR strives to create a more informed public—one challenged and invigorated by a deeper understanding and appreciation of events, ideas, and cultures. With a nationwide network of award-winning journalists and 17 international bureaus, NPR and its Member Stations are never far from where a story is unfolding. Listeners consider public radio an enriching and enlightening companion; they trust NPR as a daily source of unbiased independent news, and inspiring insights on life and the arts. Learn more at NPR.org/about or by following NPR Extra on Facebook,Twitter and Instagram. Comcast Corporation (Nasdaq: CMCSA) is a global media and technology company with two primary businesses, Comcast Cable and NBCUniversal. Comcast Cable is one of the nation's largest video, highspeed internet, and phone providers to residential customers under the XFINITY brand, and also provides these services to businesses. It also provides wireless and security and automation services to residential customers under the XFINITY brand. NBCUniversal operates news, entertainment and sports cable networks, the NBC and Telemundo broadcast networks, television production operations, television station groups, Universal Pictures and Universal Parks and Resorts. Visit www.comcastcorporation.com for more information.